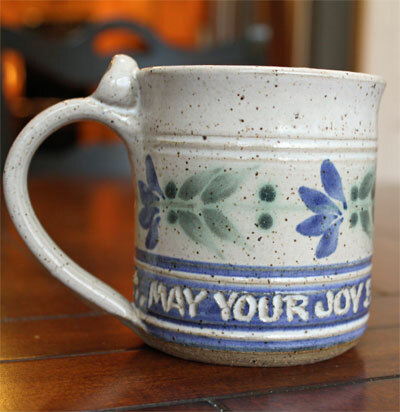 Navigate: StoreFront / Inspirational Kitchen / Scripture Pottery / Scripture Pottery Small Mug... "May your joy..."
Scripture Pottery Small Mug... "May your joy..."
Share this product and receive a $0.97 sharing discount. May your joy be made full in Christ. Measures 3 1/2" x 3 1/4". 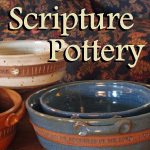 Each piece of pottery in this collection is hand made. The functional stoneware is fired to Cone 6 and is meant for daily use in the home. There is no lead in the clay or glaze. Most of the pieces from this set are decorated by hand with carved inspirational verses from the Bible and other wise sources, with polychrome brushwork flowers and designs. Each letter is carved into the damp clay, one by one, and each leaf and petal is created by hand, stroke by stroke. This pottery, which is made in the North East, wants to be taken home, to be used, to speak to you about the love of God, to sit in the kitchen with family, and be passed on to future generations. Every piece is individually made, so expect a certain amount of variation; the hallmark of pottery made by the loving, skilled eye, hand and heart of the potter is that no two pieces are exactly alike. Thank you Tom and Sally! Care: Our pottery is meant for daily use at home. It is Oven, Microwave, and Dishwasher safe. We use no lead in our clay or glazes, so that our pottery is safe for food and drink. Avoid sudden changes of temperature. Instead, give the pottery time to expand with heat and contract with cold. When you bake, for example, place your pottery in the oven filled with your favorite recipe, then turn the oven on and allow the pottery to heat up slowly with your food.